It's never too early to start thinking about Christmas especially if you're a handcrafter. 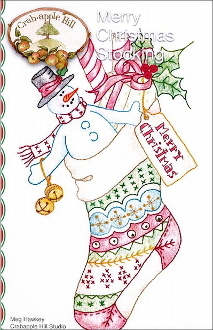 You can choose to stitch and color this "block", featuring a Christmas stocking filled with candy canes, holly sprig, gift with "Merry Christmas" tag, and even a frosty snowman, as a block for a wall hanging, pillow, table runner, place mat, or tote. Image measures about 5.5" x 9.5". Includes instructions, diagrams, and paper pattern. Please be aware that this is NOT an iron-on pattern and must be transferred to your fabric using your favorite method.